A look at how the people of Kerala go crazy over the state festival of Onam, with ten days of feasting, boat races, song, dance, and merriment. Late August or early September marks some high-spirited celebrations down south. People in the southern Indian coastal state of Kerala go crazy over the state festival of Onam. Onam Begins on August 15, and ends on August 27, 2018. 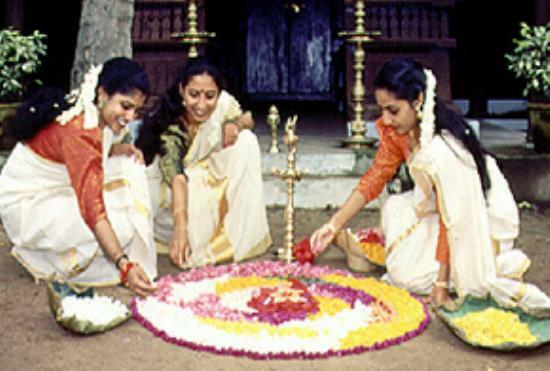 Onam or Thiruonam originated as a joyous annual reminiscence of the golden rule of King Mahabali, a mythical king, who ruled Kerala a very long time ago. It recalls the sacrifice of the great king, his true devotion to God, his human pride and his ultimate redemption. Onam welcomes the spirit of a great king and assures him that his people are happy and wish him well. 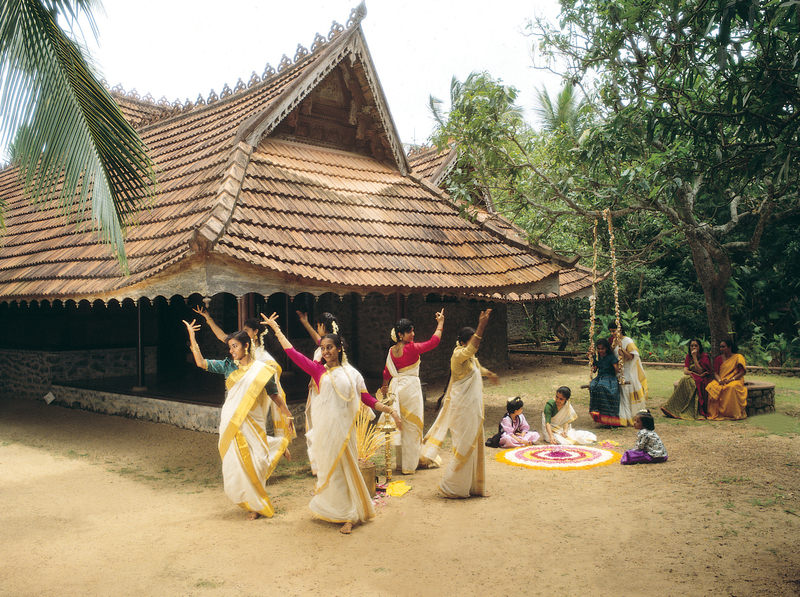 Facts and fables blend as Kerala celebrates this royal return, year after year with the festivities of Onam. Legend has it that the gods plotted against Mahabali to end his reign. For this, they sent Lord Vishnu to earth in the form of a dwarf Brahmin. But before being trampled down to the netherworld, Vishnu granted the king’s sole wish: To visit his land and people once every year. A flower carpet called ‘Pookalam’ is laid in front of every house to welcome the advent of the vanquished king, and earthen mounds representing Mahabali and Vishnu are placed in the dung-plastered courtyards. Traditional rituals are performed followed by a lavish feast called ‘Sadhya’. Onam also means new clothes for the whole family, sumptuous home-cooked delicacies on plantain leaf and the lingering aroma of the sweet Payasam. Spectacular parades of caparisoned elephants, fireworks, and the famous Kathakali dance are traditionally associated with Onam. It’s also the season of many cultural and sports events and carnivals. All this makes Onam-time a perfect period to visit this coastal state, touted as “Gods Own Country“. No wonder the Government of Kerala has declared this time every year as Tourism Week. One of the main attractions of Onam is the ‘Vallamkali’ or boat races of Karuvatta, Payippad, Aranmula, and Kottayam. Hundreds of oarsmen row traditional boats to the rhythm of drums and cymbals. These long graceful Snake Boats called ‘Chundans’ are named after their exceedingly long hulls and high sterns that resemble the raised hood of a cobra. Then there are ‘Odis’, the small and swift raiding crafts adorned with gold tasseled silk umbrellas, the ‘Churulans’ with their elaborately curled prows and sterns, and the ‘Veppus’, a kind of cook-boat. This traditional village rivalry on watercraft reminds one of ancient naval warfare. Thousands throng the banks to cheer and watch the breathtaking show of muscle power, rowing skills, and rapid rhythm. These boats – all pitted against their own kind – rip through the backwaters of Kerala in a tussle of speed. Although this festival has its origin in Hindu mythology, Onam is for all people of all class and creed. Hindus, Muslims and Christians, the wealthy and the downtrodden, all celebrate Onam with equal fervor. The secular character of Onam is peculiar to this land where unity had always coexisted with diversity, especially during festivals, when people come together to celebrate life’s unlimited joys.